Indian Ashram – A Spiritual Inn of the World. India where the first seed of spirituality & yoga sow, grow & nurture. Indian ashrams are the divine and sacred place where you can experience the spiritual cosmic energy to create the highest purpose of life which is a self-realization The ashram is a spiritual sanctum in Hinduism. The ashram is the spiritual place where you can heal and nurture your mind & body. It is an energy center to rejuvenate your body, mind & soul with the spiritual practice of Yoga & meditation. 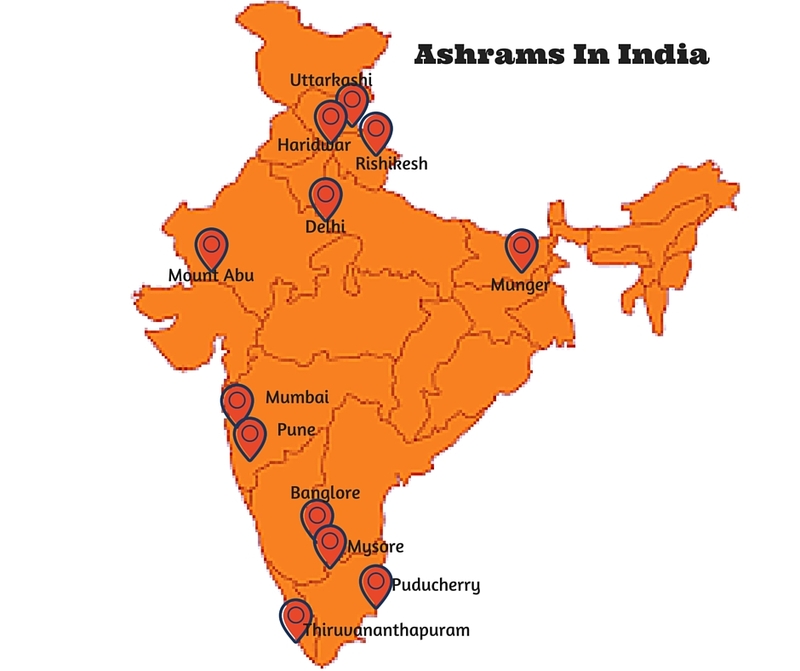 There are more than thousand of Ashrams in India spreading spirituality & yoga activities like Yoga Retreats, Spiritual Meditation Retreats, Yoga Classes, Yoga Courses, Meditation courses, Ayurveda Retreats etc. Why Must You Stay in Indian Ashrams? In India, you will find the best comfortable stay in hotels or resorts but these will only satisfy your senses. To experience something beyond senses Indian ashrams are the best and affordable stay in India. An Indian ashram is a spiritual and cosmic center which radiate a positive energy & prosperous energy around its environment. Now the Indian ashrams are fully equipped with all kind of amenities & facilities. The ashrams in India are the spiritual energy centers where you realize the spiritual energy within your body, mind & soul, that brings bliss & peace in your life. The Indian ashram also carries various spiritual activities like Yoga Retreats, Meditations Retreats, Spiritual discourses on Hinduism etc. to enhance your wisdom and wellness. We at Atmabodha help you to guide about the best spiritual ashrams in India. We create a route for you to in your spiritual journey. Atmabodha is a largest online network of top Indian ashrams, the ashrams where you can stay and spend worthy time of peace and bliss. We also offer free guidence on yoga ashrams, schools, classes, retreats & workshops in India. For the Inquiry and Booking to stay in affordable Indian ashrams, please let me know your query. Ashrams in India are the best options to explore the self and experience the true spirituality within. In my spiritual journey in India, I stayed in various ashrams in India like in Varanasi, Rishikesh, Goa, Himalayas etc and find the deep silence and the spiritual energy flowing in my body channels. Atmabodha is a great site for getting full information about the ashram to stay in India. The team is quite responsive and supportive to provide an detailed information about the spiritual ashram stay in India. Thanks team for your help.